A new survey from AAA finds that 40 percent of Americans expect partially automated driving systems, with names like Autopilot, ProPILOT or Pilot Assist, to have the ability to drive the car by itself, indicating a gap between consumer understanding of these technologies and reality. AAA also tested these systems and found that they are in fact not designed to take over the task of driving and can be significantly challenged by every day, real-world conditions such as poor lane markings, unusual traffic patterns and stationary vehicles. As this type of technology becomes more commonplace on the road, AAA cautions consumers not to take vehicle system names at face value. And, although meant to assist in the driving task, they should never be used as a replacement for driver engagement. Confusing lane markings may have contributed to a Tesla operating in Autopilot crashing into a Laguna Beach Police Dept. SUV on Laguna Canyon Road on May 29 in a marked exit lane where vehicles also park. The Tesla driver sustained minor injuries, according to police. The crash is under investigation by the National Transportation Safety Board. In partnership with the Automobile Club of Southern California’s Automotive Research Center (ARC), AAA tested four vehicles equipped with systems that combine technologies such as adaptive cruise control and lane-keeping assist to help maintain lane position, forward speed and following distance in relation to a lead vehicle. Closed-course and on-road testing evaluated performance in typical driving situations where the technology generally behaved as expected. However, there were a number of instances in both environments that caused these systems to act in an unpredictable manner, requiring driver intervention to avoid a potential collision. “While driving on public roadways, AAA found test vehicles struggled when encountering scenarios that included moderate traffic, curved roadways and faded lane markings. The systems also struggled on streets with busy intersections -- for example, Santa Monica Boulevard and Pacific Coast Highway near Malibu,” said Megan McKernan, manager of the ARC. AAA’s study also revealed that nearly 90 percent of events requiring driver intervention were due to the test vehicle’s inability to maintain lane position. The irregular and complex nature of the real-world driving environment revealed the vulnerabilities of this technology. AAA’s testing found the systems generally performed best on open freeways and freeways with stop and go traffic. During closed-course testing, common driving situations were simulated such as staying within the lane at 45 mph, following a distracted or impaired driver, encountering a commercial vehicle, such as a tow truck, or contending with a vehicle that suddenly changed lanes to reveal a stationary vehicle. All test vehicles successfully maintained lane position as well as also recognized and reacted to the presence of the tow truck with little to no difficulty. However, in the scenario where a lead vehicle changed lanes to reveal a stationary one, three out of the four test vehicles required driver intervention to avoid an imminent crash. In general, this scenario is a stated limitation of these systems, however, it is a relatively common occurrence on roadways and could take those drivers by surprise if they have become too reliant on the technology. To reduce the misuse of partially automated vehicle systems, AAA encourages drivers to educate themselves by requesting a demonstration at the dealership as well as thoroughly reading the vehicle owner’s manual. 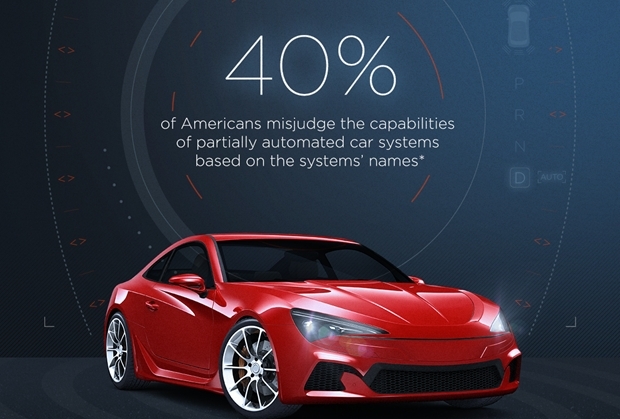 As this technology becomes more prevalent, standardized naming across vehicles that clearly reflects how technology functions will be necessary. Greater consistency across the industry will help consumers understand the type of technology their vehicle has along with how, when and where to use these systems. To assess the capabilities of partially automated vehicle systems, AAA conducted primary research in partnership with the Automotive Club of Southern California’s Automotive Research Center in Los Angeles. Track testing was conducted on closed surface streets on the grounds of Auto Club Speedway in Fontana. and was rented by AAA for independent testing. Public highway evaluation was conducted on surface streets, highways and limited-access freeways throughout the greater Los Angeles area. Four test vehicles were selected (2018 Mercedes-Benz S-Class, 2018 Nissan Rogue, 2017 Tesla Model S and 2019 Volvo XC40) using specific criteria and each test vehicle was outfitted using industry‐standard instrumentation, sensors and cameras to capture vehicle dynamics, position data and braking intervention. The consumer study was conducted Oct. 4-7, 2018.